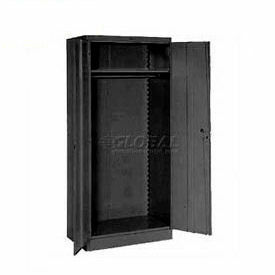 Global™ Wardrobe Cabinets Are Used For Storing Personal Belongings in Office Or Warehouse. 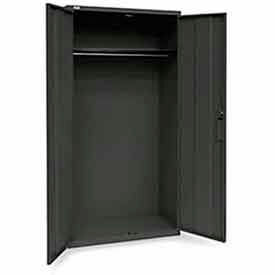 Wardrobe Cabinets are made of durable cold rolled steel using 24 gauge steel body reinforced with a 22 gauge steel frame. The channel reinforced, box formed doors include 3-point locking mechanism with a super strong 5/16" round locking bar and nylon guides for silent operation and consistent alignment. The cabinets feature one full width fixed shelf and one full width garment rod. Top Shelf allows storage of personal items. Recessed locking handle with 2 keys for safety and security. Durable powder coat finish. Available in Gray, Tan and Black. All-Welded Wardrobe Cabinets Provide Added Storage And Security To Clothing and Personal Items In Residential And Commercial Environments. Wardrobe Cabinets are made of 24 gauge all-welded steel with a powder coat finish for long lasting durability. Cabinets feature a full width fixed shelf and full width coat rod. Double doors lock with 3 point latching system providing added security and recessed handles prevent banging and catching on flush surfaces. Available colors are Charcoal, Gray, Putty, Tropic Sand and Dove Gray. Dimensions vary per model. Hallowell Solid Door Wardrobe Storage Cabinets Meet General, Office, School And Residential Storage Requirements. Hallowell Solid Door Wardrobe Storage Cabinets are made of 20 and 22 gauge steel, all welded construction for long lasting durability and dependability. Industrial models designed to meet government requirements. Combines ample storage space for personal belongings with neat, attractive appearance. 3-point positive locking and chrome plated locking handle with built-in grooved key lock provides security. All-welded frame assembly and factory hung reinforced doors ensure proper operation and fit. Greenguard Children and Schools Certified. Series types are Commercial and Industrial. Color finishes are Gray, Midnight Ebony and Parchment. Capacities are 200 lbs. and 300 lbs.. Shelf capacities are 100 lbs. and 150 lbs.. Dimensions vary per type. Quantity is 1. 2 Year Limited Warranty. 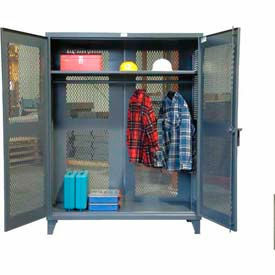 Tennsco All-Steel Wardrobe Cabinets Provide Storage and Security for Offices, Warehouses, Basements and more. Tennsco All-Steel Wardrobe Cabinets are made of durable cold rolled steel using 24 gauge steel body reinforced with a 22 gauge steel frame. Reinforced doors include 3-point locking system with die cast chrome plate locking handles for security. Locking flat bar rods include nylon guides for smooth door operation. 22 gauge steel shelves are height adjustable at 2" increments. Shelf capacity is 150 lb. Wardrobe Cabinet features one full width fixed shelf and one full width garment rod. Durable powder coat finish provides long lasting durability. Available colors are Gray, Tan, Medium Grey, Black, Light Gray, and Sand. Dimensions vary per model. Lyon Wardrobe Cabinets Are The Used Choice For Office Or Warehouse Use With Contemporary Styling And Durable Construction. These wardrobe closets have rounded front corners for an attractive, modern appearance. 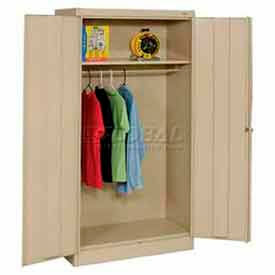 Clothes storage cabinets feature one full width fixed shelf and one full width garment rod. The precision engineering of these wardrobe closets allow quiet door operation with felt pad dampers and nylon hinge washers. These clothes storage cabinets include 3-point locking handle with 180° full swing double doors for easy access. All models include reinforced door channels for added rigidity. Shelf adjusts on 2" centers. Available in Black, Gray or Putty. Lifetime Limited Warranty. 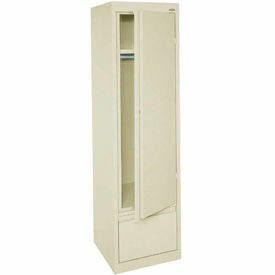 Equipto Wardrobe Cabinets Provide Locked Storage To Hold Coats, Uniforms And More. 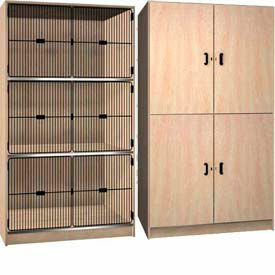 Equipto Wardrobe Cabinets are constructed of steel for long lasting durability. Provides sturdy metal rod and four hooks for hanging coats. Top shelf allow storage of personal items. Locking handles secure cabinet. Ships unassembled. Made in USA. Sizes are 36 in. W x 18 in. D x 78 in. H and 36 in. W x 24 in. D x 78 in. H. Colors are Smooth Office Gray, Smooth Reflective White, Textured Black, Textured Cherry Red, Textured Dove Gray, Textured Evergreen, Textured Putty, Textured Regal Blue and Textured Safety Yellow. Package quantity is 1. Limited Lifetime Warranty. All-Welded Sandusky System Series Single Door Wardrobe Cabinet With File Drawer and Flush Front. Constructed of 22-gauge steel in an attractive embossed textured finish that doesn't show fingerprints or scratches. Compliments any environment and provides years of long-term usage. Features full length recessed door/drawer pull and one adjustable shelf with wardrobe bar. Has tracks with steel ball bearing full suspension to ensure smooth operation and easy access. Accommodates letter or legal files. 85 lb. shelf capacity and a single door. Door and drawers are secured with a cam lock and two keys. Durable powder coat finish. Tennsco C-Thru Wardrobe Cabinets Are Used For Viewing Content Cabinets For Security Reasons Such As In Airports And More. 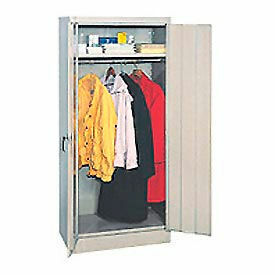 C-Thru Wardrobe Cabinets are made of heavy gauge steel for long lasting durability. 3/16" clear acrylic door panels provide visibility to stored contents without opening. Wardrobe Cabinet has one full width fixed shelf and one full width garment rod, Chrome handle. Available unassembled or All-welded. Colors are Light Grey, Black, Medium Grey, Sand and Putty. 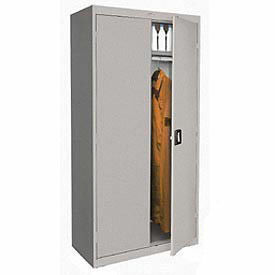 Hallowell Safety-View Door Wardrobe Cabinets Provides Locked Storage Of Uniforms, Outerwear And Other Clothing Or Accessories. 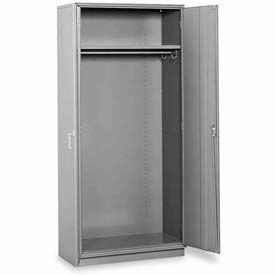 Hallowell Safety-View Door Wardrobe Cabinets are made of 20 and 22 gauge steel, all welded construction for long lasting durability and dependability. Doors permit viewing of contents through transparent windows. Industrial models designed to meet government requirements. Combines ample storage space for supplies and personal belongings with neat, attractive appearance. 3-point positive locking and chrome plated locking handle with built-in grooved key lock provides security. Shelves adjust on 2 inch centers with triple flanged front for added strength (up to 200 lbs. - uniformly distributed). All-welded frame assembly and factory hung reinforced doors ensure proper operation and fit. Greenguard Children and Schools Certified. Series types are Commercial and Industrial. Color finishes are Gray, Midnight Ebony, Parchment and Platinum. Capacities are 400 lbs. and 500 lbs.. Shelf capacities are 200 lbs. and 250 lbs.. Dimensions vary per type. Quantity is 1. 2 Year Limited Warranty. 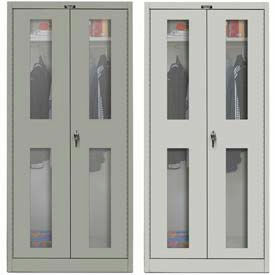 Hallowell Ventilated Door Wardrobe Cabinets Provides Locked Storage Of Uniforms, Outerwear And Other Clothing Or Accessories. Hallowell Ventilated Door Wardrobe Cabinets are made of 20 and 22 gauge steel, all welded construction for long lasting durability and dependability. Doors permit viewing of contents through transparent windows. Industrial models designed to meet government requirements. Combines ample storage space for supplies and personal belongings with neat, attractive appearance. 3-point positive locking and chrome plated locking handle with built-in grooved key lock provides security. Shelves adjust on 2 inch centers with triple flanged front for added strength (up to 200 lbs. - uniformly distributed). All-welded frame assembly and factory hung reinforced doors ensure proper operation and fit. Greenguard Children and Schools Certified. Series types are Commercial and Industrial. Color finishes are Gray, Midnight Ebony, Parchment and Platinum. Capacities are 400 lbs. and 500 lbs.. Shelf capacities are 200 lbs. and 250 lbs.. Dimensions vary per type. Quantity is 1. 2 Year Limited Warranty. 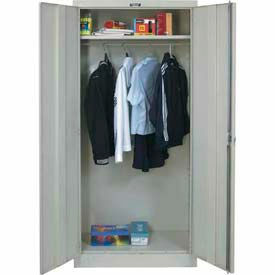 Stronghold® Heavy Duty Wardrobe Cabinets Are Idea For Schools, Laboratories, Locker Rooms And Workshops. 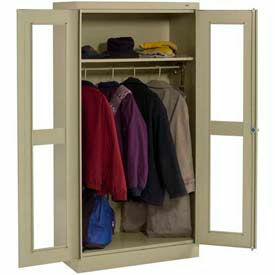 Stronghold® All Vented Wardrobe Cabinet Allows 4-Sided, Open-Air Security. Stronghold® All Vented Wardrobe Cabinets are made of all welded, 12-gauge steel for solid, long lasting durability. Ventilated side and back panels and swing-out, ventilated door panels with 3-point locking system allow for aerification of work clothes while keeping tools and supplies secure.Sturdy, adjustable shelf and rod. Unit measures 24"D x 78"H and is available in 3 widths of 48", 60" and 72". Ironwood Wood Storage Cabinets - Solid, Grill Door & Open Front Are Used For Storing Musical Instruments, Personal Belongings, Athletic Equipment And More. Ironwood Wood Storage Cabinets are made of solid wood for long lasting durability. Features doors with individual lock hasps for added security. Compartments include one full length wardrobe bar for increased versatility. Grill doors (select models) offer ventilation for increased reliability. Ships fully assembled. Styles are Double Door, Laminate Door, Black Grill Door or Grey Grill Door. Colors are Cactus Star, Dixie Oak, Folkstone, Maple, Natural Oak or Oiled Cherry. Available with 2 or 3 door openings. 48-1/2 inch Width x 30 inch Depth x 85-1/2 inch Height. 5 Year Limited Warranty. 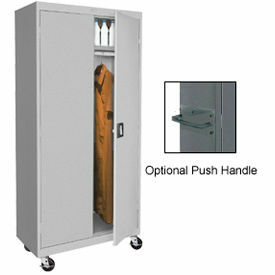 ALB Plus Wardrobe Cabinets Provide Safe, Secure Storage For Work Clothing, Protective Gear And More. 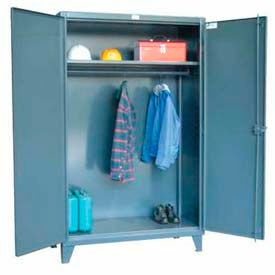 ALB Plus Wardrobe Cabinets are manufactured from high strength steel for lasting durability and dependable service. 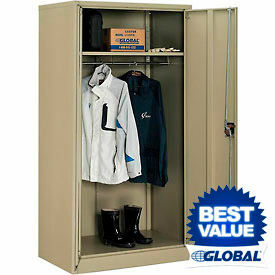 Storage cabinet includes one shelf for hard hats, tool boxes and other items and a coat rod for coveralls, uniforms and more. Flush recessed handle provides comfortable grip. Cylinder key lock secures valuable personal belongings. 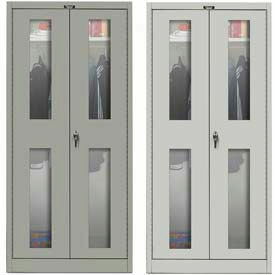 36"Wx18"Dx72"H wardrobe cabinet is available in Beige, Black, Charcoal and Light Grey colour finish.